Due to the recent executive order issued by President Donald Trump there has been confusion and concern especially among the Muslim communities, but there is no reason to be alarmed or frightened. 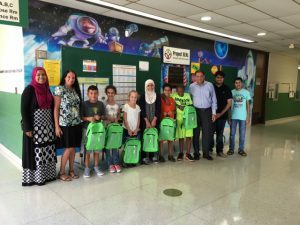 Rest assured that Muslim Association of Greater Rockford is working closely with the authorities in the region. The MAGR board has contacted the Rockford Police Department and has requested additional protection for the mosque during this time. Additionally the MAGR President and Vice President spoke directly with Congresswoman Cheri Bustos on Thursday morning. 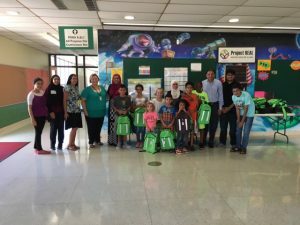 Congresswoman Bustos sends her best regards to the Muslim community and clearly stated her office is willing to assist anyone regarding immigration issues or any other difficulties they may be having. Make sure to know your rights and always act respectfully. Eid Dinner is on Saturday, September 17, 2016 at 7:00 PM sharp. Dinner catered by Anmol Restaurant and Brother Mustafa. Kindly arrive for Eid Dinner on time as we will have our local State Senator Steve Stadelman with us to talk to us for a few minutes. 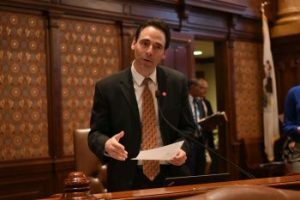 Steve Stadelman is a Democratic member of the Illinois Senate from the 34th district. 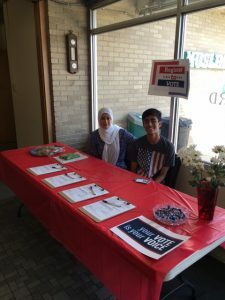 The 34th district is based in Winnebago County and includes all or part of the municipalities of Rockford, Machesney Park, Loves Park and Cherry Valley. 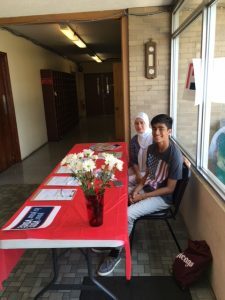 One of our Youth Yusuf Zahurullah manning the Voter Registration Booth with the help of his mother Sis. Sameena Zahurullah. 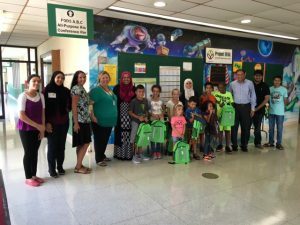 On August 19, 2016 MAGR visited the Rolling Green Elementary School in Rockford, IL and donated 100 back packs, note books and pencils to the students at Rolling Green Elementary School with the help of some donations from ICNA and Sister Fadwa Abu Fanas. The Public Relation Chair for MAGR, Capt. Shahid Naseer personally visited the school along with volunteers, Hafsa Siddiqui, Hamza Zahurullah and Arslaan Naseer. The Principal of the School and the Staff of the Rolling Green School were very appreciative of the effort made by MAGR to help the needy children. 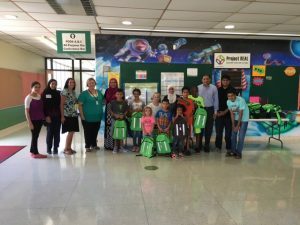 This is another great example of our Mission to reach out to the Rockford community and help out those that are in need. May Allah accept our good deeds.